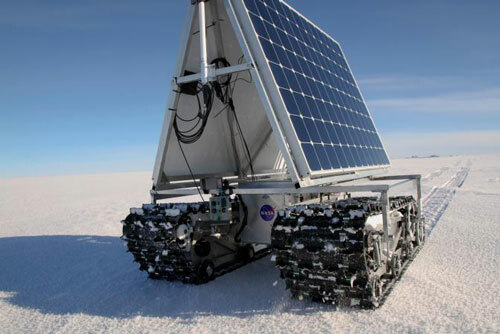 (Nanowerk News) Defying 30 mph gusts and temperatures down to minus 22 F, NASA’s new polar rover recently demonstrated in Greenland that it could operate completely autonomously in one of Earth’s harshest environments. Although researchers had tested GROVER at a beach in Maryland and in the snow in Idaho, the May 6 to June 8 testing at Summit Camp, the highest spot in Greenland, was the rover’s first polar experience. One of the main goals was proving that the robot could execute commands sent from afar over an Iridium satellite connection – an objective GROVER accomplished. GROVER collected and stored radar data over 18 miles during the five weeks it spent on the ice. During the testing, the rover was also able to transmit information in real time on how its onboard systems were performing. The robot’s solar-charged batteries allowed it to operate for up to 12 hours before having to recharge. Though researchers had initially expected the 800-pound robot to work around the clock and cover more ground, the extreme polar conditions took a toll on GROVER’s electronics, battery consumption and mobility. GROVER’s test in Greenland coincided with the field-testing of a smaller, non-autonomous and faster robot called CoolRobot, built by Dartmouth College. Marshall said that in the future, he would like to see the different science teams that are currently developing polar rovers work together to create a pool of robotic platforms, which glaciologists could borrow from for their studies.